Olympus just announced a new Japan-only product that mimics what Sony did last year with their QX line. 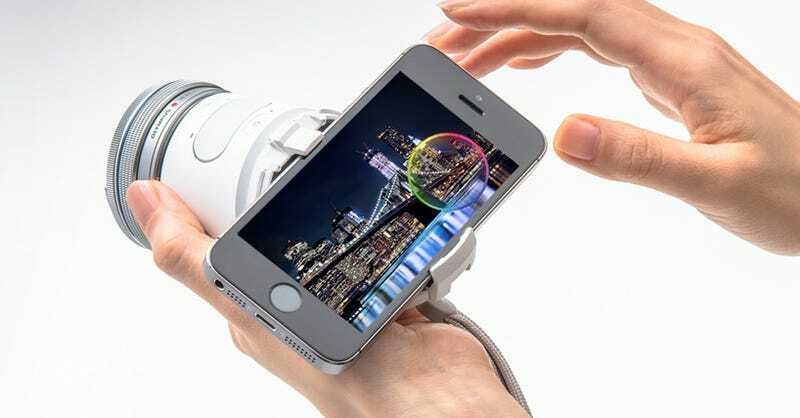 It's a camera sensor and lens mount that's controlled completely by your smartphone. The Air A01 uses a hot 16 megapixel micro four-thirds sensor and is compatible with all lenses for that system. Sony had a lot of people scratching their heads when they devised this weird concept of strapping a bulbous cylinder to the backside of a phone. It worked with mixed results, and later they came out with a version that used interchangeable E-mount lenses. All-in-all, Americans didn't quite bite. But the cameras fared better in Japan, which is why Olympus decided to limit the Air A01's release to that country. This odd device grips the sides of your smartphone at an angle, and connects via WiFi. Everything is controlled from the Olympus companion app, but the Air A01 does have a physical shutter button for more of a camera feel. The guts seem pretty formidable, with an 81 point AF system, 10 fps burst mode, and an electronic shutter with speeds up to 1/16000. Sounds a lot like the specs of the just-announced OM-D E-M5 Mark II! It looks like you'll only get to try out the Air A01 if you live in Japan, unless it becomes such a hot seller that they migrate it over to the USA.